a syndicalism for the 21st century? It seems unlikely that the centenary of the 1910-14 Great Unrest will gain much attention in the media – if, indeed, it gets a mention at all. But, for supporters of workers’ revolutionary self-activity, this is an anniversary to remember. This largely unpredictable outburst of conflict began in September 1910 when miners in the South Wales coalfield embarked on an extended series of strikes sparked by the problems faced by piece-rate miners working unproductive seams. Their anger was intensified by the employers’ withdrawal of miners’ customary rights to use “waste wood” from the pit. As the miners’ struggle subsided, another front opened amongst seamen, dockers and railway workers in the transport strikes of 1911. The virulent anti-unionism of the Shipping Federation in the face of demands for recognition stoked largely unofficial conflict over pay when Southampton seafarers refused to board ship unless their wages were increased. The action spread to Hull, Goole, Manchester and Liverpool, and soon extended to dockers, many of whom shared the same draconian employer. Groups of factory workers from the area joined in with demands centring on wages and union recognition. At the same time as strikes were spreading in the North, a new outbreak of unrest exploded among London dockers. Here the employers, intimidated by the unrest, offered more generous agreements, but the mood of militancy had spread, with dockers rejecting a significant pay increase; as Ben Tillett wrote, “They wanted more…”. As the London dock strike subsided, unofficial action by railway workers on Merseyside began, sparked by static wages and the slow-moving “conciliation” system for dealing with disputes. In August 1911, goods rail workers, whose work in dockland railway depots meant close connections with dockers and seafarers, walked out. Before long an unofficial strike committee had been convened and rapidly set about organising sympathy strikes by other transport workers. By 10th August 15,000 railway workers were on strike, along with thousands of dockers, carters and local municipal workers out on their behalf. The Shipping Federation imposed a lockout, but this simply provoked a general strike call from the committee. Within a week the numbers on strike had risen to about 70,000. This strike wave took on an increasingly violent character, with mass pickets attacking scab workers and sabotaging goods. The strike committee eventually managed to gain some control with a system of official permits which brought a “dual power” aspect to the dispute with organisations from the Post Office to the Canadian Pacific Railway Company obliged to seek permission to move goods. Large bodies of troops and police were called in to control the strikers, while traditional hostilities between Catholics and Protestants disappeared as the whole working class of Merseyside united in struggle. On 13th August – “Bloody Sunday” – a mass labour demonstration of 80,000 workers, including women and children, was violently dispersed by police and troops. Workers from Liverpool’s North End fought bitterly to keep the army and police out of their communities; the “guerrilla warfare”, as the Times called it, continued for days, with the use of barricades and other classic insurrectionary tactics. When the embattled strikers attacked prison vans transporting convicted rioters, the struggle climaxed with the fatal shooting of two strikers. After another ten days of sporadic conflict, the mass strike was over. Yet the strike wave continued, shifting back to the mining industry in the winter of 1911-2 as a month-long strike took place for a minimum wage. This relatively “official” demand was supported by the union leadership, but the decision to strike came from local mining activists mostly still concentrated in the South Wales coalfields but now spreading to Northumbria and Durham. Direct action in the North East coalfield triggered the rapid deployment of troops to mining areas. Even when the government passed a Minimum Wages Act, apparently addressing one of the miners’ central demands, militancy only increased, at least partly because of the act’s inadequacies. It was only in April that the last bastions of resistance against a settlement reluctantly agreed to return to work. In June and July 1912, yet another dock strike broke out in London, characterised by massive marches from the East End into central London which recalled those of the historic 1889 strike for a decent wage, the so-called “dockers’ tanner”. On the docks themselves, armed battles took place between strikers and scabs, expressing a bitterness which intensified as the employers refused any concessions. The strike’s eventual collapse at the end of July was due largely to this employer intransigence, but lack of solidarity from the provinces was another factor. At the same time, the continued vitality of the Great Unrest was indicated by a strike by Merseyside dockers in July 1912, the same month the London dock strike ended. In 1913 and 1914, unrest broke out in unrelated areas, primarily engineering and building but also amongst agricultural labourers, municipal employees and china clay workers. In the Leeds Corporation strike of 1913, strikers sabotaged the city’s electricity supply, while violent conflict between police and strikers marked the Cornish china clay workers’ struggle the same year. The building trade, also widely affected by deskilling, was the next combatant in the battle. This time the conflict culminated in a lockout rather than a strike; the employers had learnt their lesson. Presaging their later dominance in First World War struggles, however, it was engineering workers who dominated the latter two years of the Great Unrest. Much of the conflict took the form of small localised strikes over issues like bonus payments and working patterns, but the underlying significance of the unrest was epitomised in a major strike wave in the Black Country in which semi-skilled, unskilled and female engineering workers mobilised to demand union recognition and a minimum wage. The scale of the unrest was reflected in local militants’ description of the strike as “the last dying struggle of capitalism”; members were urged to fight “not for two bob a week…but the world for the workers” (quoted from the syndicalist magazine Solidarity). But perhaps the most potentially revolutionary episode of the Great Unrest occurred among transport workers in Dublin. The strikes began in August 1913 with tram workers literally walking off their trams, but were almost immediately converted into a lockout as punishment for the strikers’ rebellion under the inspiring leadership of syndicalist and socialist James Larkin. Massive solidarity was expressed by rank and file workers throughout Britain. It was only the first world war, with its jingoism and culture of “national sacrifice” which, at least temporarily, brought the strike wave to an end. As the above suggests, the Great Unrest was noteworthy not only for its volcanic workplace-based revolt against capital but for the role of rank and file leaders whose political philosophy extended far beyond the language of compromise and negotiation. In outlining these events, therefore, the intention is not only to draw attention to an important – and relatively neglected – episode in labour history but, of course, to examine its political significance. In doing so, pride of place must be given to the central role of syndicalism. While one key history (Bob Holton, British Syndicalism 1910-1914) argues that the strikes themselves indicated a “proto-syndicalist mood” rather than explicit adoption of this quasi-revolutionary approach, syndicalist strategy and tactics played a key role in consolidating, organising and spreading the strike activity. Syndicalists acted as an early “Minority Movement”, rendering already-existing activity more effective through promoting internal union democracy and class solidarity. In this sense “the fact that workers were often moving ‘spontaneously’ in a syndicalist direction helped the organised [syndicalist] movement to influence strike policy and make new recruits” (Holton, p136). But what were the syndicalists’ main objectives? Leaving aside the particular circumstances of the Great Unrest, these included an emphasis on workers’ control, often in terms of its extension to forms of direct social ownership, industrial unionism and its corollary in union amalgamation, anti-parliamentarianism and a healthy distrust of the union bureaucracy. While the conventional critique of syndicalism as neglectful of the role of the state has little foundation, a lack of full strategic awareness of the willingness and indeed ferocity of the capitalist state in mobilising for its own interest can be identified as a key weakness. Such confusion can be argued to have prevented, perhaps even more damagingly, full analysis of the role of the supporters of that state within the labour movement. In this field, syndicalist praxis was undermined by a strategy which leaned towards attempts to influence the left wing of the union bureaucracy and push for the election of militants to union office, rather than focussing on the independence and accountability of workplace union representation. This had predictable results; as Willie Gallacher later put it, ‘Every time we succeeded in making one of our own comrades an official of the trade unions, it turned out that…the trade unions corrupted our own comrades too.’ Such confusions create crucial lessons for socialists’ approach to organising within the trade unions today. … For the 21st century? Almost exactly one hundred years since the Great Unrest, syndicalist ideas continue to attract support, particularly – and valuably – amongst young activists. Is syndicalism as relevant today as in the early 1900s? And, equally importantly, does the syndicalism of the 21st century perpetuate any of the political misunderstandings and failings of its 20th-century predecessor? The answer to the first question can only be positive. Despite all claims to the contrary, a working class still exists, still constitutes a majority of the population, and still engages in class struggle. While the struggles of 2010 can hardly be compared – so far – to those of 1910, the potential, as always, remains. The issue, as in the Great Unrest and beyond, is the relationship between such workplace-based conflict and the political ideas and policies which can lead it in a transformative direction. Here, the lessons of the later First World War struggles can provide still more useful guidance. James Hinton’s classic study, The First Shop Stewards’ Movement, provides crucial insights into an advance beyond syndicalism towards what might be described, clumsily, as “sovietism” by the activists who led a significant revolt against capital during this period. 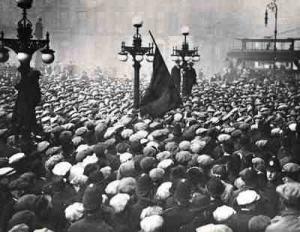 The delegate-based structures of the workplace committees set up on the Clyde and beyond allowed for forms of direct democracy and independence from trade union officialdom crucial to the beginnings of consciously revolutionary organisation amongst rank and file workers. The lack of unity between different sections of the working class which eventually undermined the revolutionary implications of such “sovietised” organisation should not undo the crucial class lessons of this workplace-committee-based organisation – a structure which can be, and often is, reproduced in our own times. The contrast between such structures and the more problematic assumptions of syndicalism is well expressed in Hinton’s comment that the “ideological achievement” of the workers’ committee movement was “to substitute the local soviet… for De Leon’s national Industrial Union as the basic unit of working-class power” (p301). There is very little contradiction between the identification of today’s syndicalists with struggles in all sections of the working class, along with a refreshing support for direct action rather than the symbolic “campaigns” so beloved of the British labour movement, and a perspective which can begin to work with already-existing activists to magnify the class potential of everyday workplace-based struggle. There is a parallel between the struggles of the period from around 1910, until the mid 1920’s, with the struggles that began in the late 1960’s, until the mid 1980’s. Both have a common root – the ending of a Long Wave Boom. In both periods, that Long Wave Boom had created condiitons udner which workers had been able to gradually gain confidence as the demand for Labour-power increased, and so the demand/supply balance swung in favour of workers, with the consequent result of rising living standards. Where workers did need to undertake any kind of action to obtain pay rises, the most effective form was the short militant action, to which employers quickly responded with concessions, because a strike would mean large losses of trade and profits. The concomitant of that was a strengthening of the rank and file and weakening of the union bureaucracy. However, the other concomitant is the effect on workers consciousness. The ability to win what appear significant concessions from within the system, based on such militant action, gives rise to the false consciousness that such action can ALWAYS result in such concessions, provided it is militant enough. It is a false consciousness for the reasons Marx and Engels set out. Marx, also spelled out the reasons why workers could not raise their wages above the Value of Labour Power, for any sustained period in “Value, Price and Profit”, and why workers should not, therefore, waste too much time on such “guerilla” actions, as opposed to seeking to change the fundamental reasons for their problems, rooted in their separation from ownership of the means of production, and the need, if such a programme of developing Workers Co-operatives was to succeed, of creating a Workers Party, to struggle for political power. See my blogs The Lessons Of UCS. The ideology that arises on the back of such success, during a period of Long Wave Boom, is that of bargaining within the system, an ideology that can take either a syndicalist form or a reformist form. One merely locates the arena of bargaining within the industrial arena, the other the parliamentary arena. But, for the reasons that Marx and Engels set out, both are dead ends. Once the long Wave Boom ends, if not sooner, the economic reality re-asserts itself. It is no longer a rational response of bosses to respond to workers demands with concessions for fear of losing trade and profits. Bosses resist more, and the change of the economic conjuncture means that the favourable balance of demand/supply for labour power places workers in a weaker position. Strikes, become more lengthy, which provides the conditions for the TU bureaucracy to intervene, and sell-out. Typically, the bosses then take the opportunity not only to take back the concessions previously given, but to re-organise production, in such a way that the power base of the workers is itself weakened. What we see in the period 1910-1926, as in the period 1968-1984, is the fact that workers are faced with the reality that more militancy is not enough. Even at the beginning of such periods, the built up strength and organisation of the workers might be enough to defend against attack, but struggles become defensive rather than offensive, they become prolonged, and more bitter. Witness the 1974 – Miners Strike. The longer such a period continues without the working class being able to impose its own political solution, the weaker the position of the workers becomes, and the stronger that of the bosses. Witness the 1984 Miners Strike, or the defeat of the 1926 strike, and indeed the defeats of workers in many of the struggles of the mid to late 1920’s, culminating in the rise of Nazism, and fascist or Bonapartist regimes. In the Long Wave Boom of the late 1880’s to 1914, it saw the rise of the Lassallean and Fabian Social Democratic parties of the Second International, as well as the various syndicalist organisations. In the late 1960’s, and up to the mid 1980’s, it saw the rise of the Labour Left, Bennism, the AES, as well as the growth of syndicalist groups such as the SWP. But, the lesson of both periods and of the role of reformism and syndicalism in both is that they could offer no political solution to the workers, and, therefore, ultimately led to its defeat, and a period of reaction that lasts not only for the period of the Long Wave downwave, but for some time after that, as it takes time for workers confidence, and organisation to be rebuilt – workers confidence, and organisation didn’t really emerge until the late 50’s, despite the fact that the Long Wave Boom had begun in 1949. The lesson is that workers need to create their own solutions to the problems they face, and that is the real meaning of self-activity, not the limited sense of militant action. It means as Marx and Engels said changing the material conditions of their existence that flow from their alienation from the means of production, and the social relations, and ideology that flows from that. It means building Co-operative production to achieve that transformation in the workers condition and ideas, and the building of a Workers Party to codify those ideas, and to fight for them and the workers interests on the political stage, and against the inevitable attempts of the bosses to frustrate the spread of worker-owned property. I recently heard it said that the catastrophic defeat of the South Wales miners in this wave of strikes was the single biggest political factor in the triumph of Fabianism over commonwealth socialism in the Labour Party. Surely the lessons to be learn are how, we move beyond ever increasing ‘militancy’ which can remain contained within the logic of capital, to the moments of disruption and self organisation that seek to more beyond their contradictions through their negation. Not just the continual repeating of the failed strategies of the past. At least this article attempts to analyse the strengths and weakness of this movement and assess why it failed. Whilst you constantly repeat this mantra, attempting to buttress this with quotes from Marx and Engels.